Bu çalışmada anti-kloroglioksim (gly) ile p-toluidin (ptol) reaksiyonundan (1Z, 2E)-N’-hidroksil-2-hidroksiimino-N-p-tolil-asetamidin (H2L) ligandı literatürde belirtildiği şekilde sentezlenmiştir. Daha sonra bu ligandının Fe(II) ve Zn(II) metal kompleksleri sentezlenmiştir. Ligandın yapısı elementel analiz, 1H-NMR, 13C-NMR, FT-IR, UV-Vis metotları ile aydınlatılmıştır. 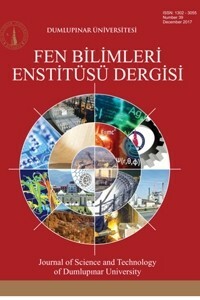 Amorf halde elde edilen Fe(II) ve Zn(II) komplekslerinin yapıları ise elementel analiz, ICP-OES, FT-IR, UV-Vis, manyetik duyarlılık ve molar iletkenlik sonuçları dikkate alınarak önerilmiştir. In this study, (1Z,2E)-N'-hydroxy-2-(hydroxyimino)-N-(p-tolyl)acetimidamide (H2L) ligand was synthesized, which is reported in literature, and ligand constituted anti-chloroglyoxime (gly) and p-toluidin (ptol) was synthesized and its metal complexes with Fe(II) and Zn(II) were obtained. The structure of ligand has been proposed by using elemantal analysis, 1H-NMR, 13C‑NMR, FT-IR, UV-Vis techniques. The structure of amorphous Fe(II) and Zn(II)complexes have been proposed by using elemantal analysis, ICP-OES, FT-IR, UV-Vis, magnetic susceptibility and molar conductivity techniques. Karapınar, E., Karapınar, N., Ozcan, E. and Coskun, A., (2007) Synthesis, characterization and extraction properties of four unsymmetricall vic-dioximes and their complexes with Nickel(II), Cobalt(II) and Copper(II). Synthesis and Reactivity in Inorganic, Metal-Organic, and Nano-Metal Chemistry, 37(8), 611-619. Kesimli, B., Topaclı, A., Topaclı, C., Gumus, G., Gurol, İ. and Ahsen, V., (2005) Langmuir monolayers with some vic-dioxime ligands and their complexation behaviour. Colloids and Surfaces A: Physicochemical and Engineering Aspects, 256, 137-143. Derelankol, M.J. and Rusch, G.M., (2008) Oxime Silanes: Structure/Toxicity Relationships. Drug and Chemical Toxicology, 31(1), 97-114. Harbecka, M., Sen, Z., Gurol, I., Gumus, G., Musluoglu, E., Ahsen,V. and Ozturk, Z.Z. (2011) Vic-dioximes: a new class of sensitive materials for chemical gas sensing, Sensor. Actuator. B 156 673-679. Jankowiak, A., Jasin´ski, M. and Kaszynski, P., (2007) 1,1′-Bis(3-hydroxypropyl)ferrocene: Preparation and substitution with polyfluoroalkyl groups, Inorganica Chimica Acta, 360(11), 3637-3641. Musılova, L., Kuca, K., Jung, Y.S. and Jun, D., (2009) In vitro oxime-assisted reactivation of paraoxon-inhibited human acetylcholinesterase and butyrylcholinesterase. Clinical Toxicology, 47(6), 545-550. Mokhir, A., Kraamer, R., Voloshin, Y.Z. and Varzatskii, O.A., (2004) Synthesis and DNA binding properties of dioxime–peptide nucleic acids. Bioorganic & Medicinal Chemistry Letters, 14(11), 2927-2930. Schrauzer, G. N. and Kohnle, J., 1964, Coenzym B12-Modelle. Chemische Berichte, 97, 3056-64. Dede, B., Özen, N. and Görgülü, G., (2018) Synthesis, characterization, theoretical calculations and enzymatic activities of novel diimine-dioxime ligand and its homodinuclear Cu(II) complex. Journal of Molecular Structure, 1163 357-367. Babahan, İ., Coban, E.P. and Bıyık, H., (2013) Synthesis, characterisation and antimicrobial activities of vicdioxime derivatives containing heteroaromatic hydrazone groups and their metal complexes. Maejo International Journal of Science and Technology, 7(01), 26-41. Osunlaja, A.A. Ndahi, N.P. and Ameh, J.A., (2009) Synthesis, physico-chemical and antimicrobial properties of Co(II), Ni(II) and Cu(II) mixed-ligand complexes of dimethylglyoxime - Part I. African Journal of Biotechnology, 8(1), 4-11. Deveci, P. and Arslan, U., (2011) Synthesis of novel ferrocene containing vic-dioxime ligands and their Ni(II), Cu(II) and Co(II) complexes: Spectral, electrochemical and biological activity studies, Journal of Organometallic Chemistry, 696(23), 3756-3763. Babahan, I., Öztürk, S.E. and Çoban, E.P. (2015) Spectroscopic and biological studies of new mononuclear metal complexes of a bidentate NN and NO hydrazone–oxime ligand derived from egonol. Spectrochimica Acta Part A: Molecular and Biomolecular Spectroscopy, 141, 300-306. Altintop, M.D., Kaplancikli, Z.A., Çiftçi, G.A. and Demirel, R. (2014) Synthesis and biological evaluation of thiazoline derivatives as new antimicrobial and anticancer agents, European Journal of Medicinal Chemistry, 74 264-277. Tan, N. and Bekaroğlu, Ö., (1983) Synthesis of some organometallic compounds of 1,2-acetonaphthylene dione dioxime and comparison with B12 model compounds. Synthesis and Reactivity in Inorganic, Metal-Organic, and Nano-Metal Chemistry, 13(5), 667-682. Oguchi, K., Sanui, K. and Ogata, N., (1990) Relationship between electron sensitivity and chemical structures of polymers as electron beam resist. VII: Electron sensitivity of vinyl polymers containing pendant 1,3-dioxolan groups, Polymer Engineering & Science, 30(8), 449-452. Chakravorty, A., (1974) Structural chemistry of transition metal complexes of oximes, Coordination Chemistry Reviews, 13, 1–46. Nesmeyanov, A.N. and Nesmeyanov, N. A., (1976) Fundamentals of organic chemistry, Moscow Mir Published, Moscova, 2, 166. Milios, C.J., Stamatatos, T.C. and Perlepes, S.P., (2006) The coordination chemistry of pyridyl oximes, Polyhedron, 25(1), 134-194. Smith, A.G., Tasker, P.A. and White, D.J., (2003) The structures of phenolic oximes and their complexes, Coordination Chemistry Reviews, 241, 61-85. Egneus, B., (1972) Investigations of dioximes and their metal complexes: A survey of the literature since 1963, Talanta, 19(11), 1387-1419. Panja, P.K., Bala, S. and Pal, C., (1991) Infrared spectroscopic studies of dimethylglyoxime chelates of Ni(II), Co(II), Cu(II), Pd(II) and Pt(II), Journal of Molecular Structure, 249, 277-283. Özcan, E. and Mirzaoğlu, R., (1988) Synthesis of Four New Substituted Arylaminoglyoximes and Their Complexes with Copper(II), Nickel(II), Cobalt(II), and Palladium(II), Synthesis and Reactivity in Inorganic, Metal-Organic, and Nano-Metal Chemistry, 18(6), 559-574. Özek, A., Büyükgüngör, O., Ilkimen, H. and Yenikaya, C., (2007) (1Z,2E)-2-(Hydroxyimino)-N-p-tolylacetamide oxime, Acta Crystallographica Section E, E63(12), o4738–o4738. Geary, W.J., (1971) The use of conductivity measurements in organic solvents for the characterisation of coordination compounds, Coordination Chemistry Reviews, 7(1), 81-122. Kaya, M., Demir, İ. and Yenikaya, C., (2008) Synthesis and Characterization of Complexes of vic-Dioxime Derivatives with Transition Metal, Asian Journal of Chemistry, 20(3), 2221-2228. Kaya, M., Yenikaya, C., Demir, İ. and Kalfa, O.M., (2008) Synthesis And Characteristics of N-(Glyoxyldioxime)-N'-(2-hydroxybenzylidene)-1,4-diaminonaphthalene And Its Metal omplexes”, Russian Journal of General Chemistry, 78(5), 939–945. Yenikaya, C., Kaya, M. and Demir, İ., (2008) Synthesis of a Imine vic-Dioxime Ligand and Its Ni(II), Co(II), Cu(II) Complexes, Asian Journal of Chemistry, 20(7), 5651-5657. ISNAD İlkimen, Halil . "(1Z, 2E)-N’-HİDROKSİL-2-HİDROKSİİMİNO-N-p-TOLİL-ASETAMİDİN LİGANDININ Fe(II) VE Zn(II) KOMPLEKSLERININ SENTEZI VE YAPILARININ AYDINLATILMASI". Dumlupınar Üniversitesi Fen Bilimleri Enstitüsü Dergisi / 041 (December 2018): 13-22.